Fiboflapon Sodium is a 5-lipoxygenase inhibitor potentially for the treatment of asthma. Fiboflapon is a potent FLAP(5-Lipoxygenase-activating protein) inhibitor with binding IC50 of 2.9 nM. AM679 is a potent and selective FLAP inhibitor with IC50s of 2.2 nM/0.6 nM/154 nM for FLAP binding/hLA/hWB respectively. 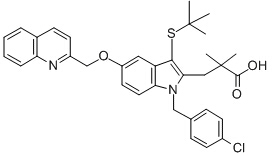 MK886 is a 5-lipoxygenase-activating protein inhibitor and a leukotriene biosynthesis inhibitor (IC50=2.5 nM). 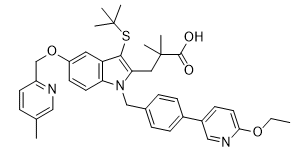 MK-0591 is a selective and specific 5-Lipoxygenase-activating protein (FLAP) inhibitor.